Based on the beloved Academy Award winning Disney film, this nine-time Tony nominated musical continues to win the hearts of people all over the globe. Trapped in her provincial town life, an intelligent, young beauty risks everything to become the heroin of her own story and break a wicked spell imprisoning a castle full of enchanting misfits and a terrifying beast. "...�Beauty and the Beast� remains a huge title at the box-office � but new directors with fresh productions have to face a lot of challenges, not the least of which is the audience�s expectation that young theatergoing princesses will experience something comparable to the movie and the original theatrical staging, both of which were much the same. This frustrates many artistes who want to bring new vistas to material, even though Disney won�t let them change a word." "...Director Alan Souza and choreographer Ron De Jesus have packed the new Drury Lane production with a feast of sumptuous dazzle. �Be Our Guest� is as eye-popping as Saturday night at the Moulin Rouge in the heart of the Belle Epoch." "...Longing, conviction and not judging a book by its cover. 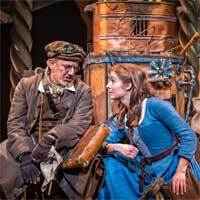 These are at the heart of "Disney's Beauty and the Beast," the rousing and relevant "tale as old as time" musical currently commanding the stage at Oakbrook Terrace's Drury Lane Theatre under the direction of Alan Souza." "...It doesn't help that Erica Stephan and Brandon Contreras lack any chemistry as Belle and the Beast. I doubt audiences would notice their costumes if they really believed the two were falling in love. The only believable couple in the show is Nick Cosgrove's too tightly wound Cogsworth and Tony Carter's adorably flirtatious Lumiere. Every time they stepped on stage, I found myself wishing I was at a new, as yet unwritten musical, centered on these two." "...Beauty and the Beast is filled with authentic emotions, humor, laughter and some unforgettable beloved characters such as Mrs. Potts (teapot) played by Bri Sudia. Nick Cosgrove played the head of the household staff that's now a clock named Cogsworth the clock, however, Tony Carter steals the show in one of the best performances of the night playing the kind-hearted but rebellious valet, Lumiere. Carter's grandiose and ostentatious candelabra were hilarious and entertaining." "...As we were leaving our home yesterday, heading thru rush hour traffic to Drury Lane Theatre in Oakbrook, Jane said , �We have seen �Beauty and the Beast� so many times. Why, again?� I always tell her, that the great thing about live theater over film is that every time you see it, it is different! A different cast, different director, set, stage. Yes, for the most part the script is the same, the score ( with some modifications, at times) but even the responsiveness of the audience can change the production. At least for that night." "...Decked out with glorious sets, costumes and special effects, a lush-sounding live orchestra and a hardworking ensemble of singers and dancers, this production is guaranteed to impress and dazzle. With the holidays fast approaching, audiences should immediately reserve their tickets for a production that remains a �Tale as Old as Time,� and one that should not be missed." "...I�ve seen �Beauty and the Beast� before and enjoyed each production primarily for its spectacle. The Drury Lane version revealed for the first time that �Beauty and the Beast� is a terrific musical and not just a flashy amusement for wide-eyed children and their tolerant parents. It stands with �The Lion King� at the head of the Disney musical comedy line. Drury Lane has poured a vast amount of resources into their production, to which spectators of all ages can only say, �For this gift much thanks!�"
"...The Drury Lane Orchestra is in top form under the direction of Christopher Sargent. Belle�s stunning yellow gown, and all of the marvelously detailed costuming, is the work of designer Ryan Park. With Ryan O�Gara�s lighting and a dizzying array of ingenious properties from designer Cassy Schillo, �Beauty and the Beast� has something for everyone."